Three 22nd Air Refueling Wing Public Affairs Airmen reach out to Airman 1st Class Christopher Thornbury, front-center, Dec. 11 at McConnell Air Force Base, Kan. Thornbury says his Air Force family has been with him for over a year and helped him through the loss of his son, Emmitt Alan Thornbury. 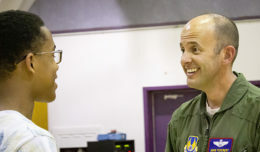 MCCONNELL AIR FORCE BASE, Kan.– I joined the military to provide for my family, but I never would have expected the challenges my family would face and how we would evolve. 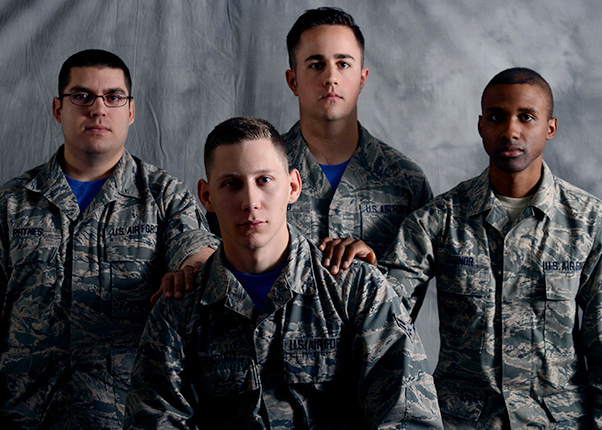 When I enlisted in the Air Force I joined another family without intent. This family has been with me ever since, especially during my family’s darkest tragedy. After completing basic military training and tech school, my family and I made the 303-mile drive from our hometown, Lebanon, Missouri, to McConnell Air Force Base, Kansas. We didn’t know anyone or anything about the area before arriving. It was only my wife Kristina, my daughter Kierstin and myself. My co-workers welcomed us and within a few months, I had made friends at work. We soon found out that our immediate family was going to grow. We were going to have a baby boy, who we decided to name Emmitt Alan Thornbury. On Sept. 18, 2015, Emmitt was born. We didn’t have the chance to raise Emmitt. We’ll never know what kind of man he would become, if he’d have my blue eyes or his mother’s dimples. We won’t be able to take him to ballgames or pick him up after a fall. We won’t be able to hold and comfort him when he is upset — because he isn’t with us anymore, but he is still with us in our hearts. His fragile body couldn’t support life outside his mother’s safe womb. He only lived a little over an hour but the impression he left will last forever. We didn’t go in blind though. We knew Emmitt was going to face challenges when the doctors spoke to us about his deformities caused by his condition, Trisomy 18. It was gut-wrenching when they began talking about how much time we would have with him. They weren’t talking about years or even months, not even days; they were talking about minutes and hours. Hearing this hit me harder than a speeding train and took me to an emotion I didn’t know existed. 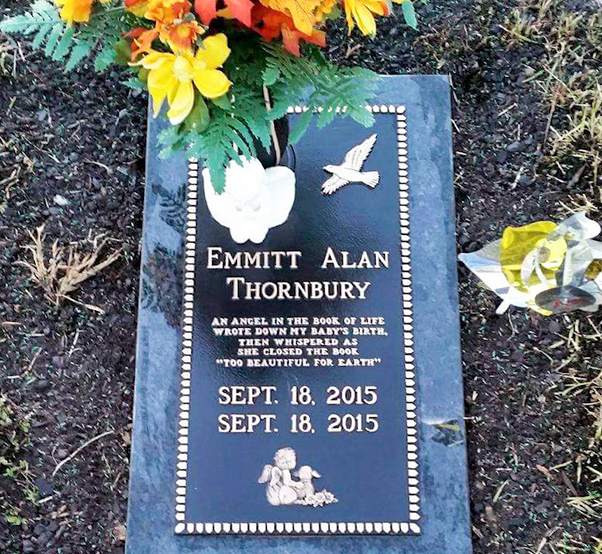 A picture of Emmitt Alan Thornbury’s headstone, son of Airman 1st Class Christopher Thornbury, a 22nd Air Refueling Wing Public Affairs photojournalist, laid to rest in Lebanon, Mo. Emmitt passed away as a result of his deformities caused by his condition, Trisomy 18. My leadership was incredible. They made sure I was at every appointment and ensured I knew all my options so we could take the best course of action. This allowed Emmitt and Kristina to go to one of the best hospitals in the nation for children with severe problems. If he had any chance of survival, it would be there and my leadership made it possible. I was given emergency leave so we could stay at the nearby Ronald McDonald House allowing us to be close to the hospital with the best care possible. In the end, the doctors couldn’t save our son but knowing we tried has made our situation easier to live with. I received calls, texts and messages from many people sending condolences and asking if there was anything they could do. 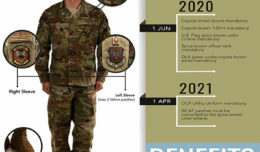 A vast majority of those people I had just met within the year and a half of my enlistment, not in my 24 years before; they were co-workers, mentors, instructors and my leadership. It was my Air Force family that really made the effort to make sure we were OK.
We had the funeral in our hometown, so he could be near family. It was a difficult day that I wish no parent will ever have to go through. Before the funeral, my brother came up to me and said, “Your friends are here.” As I went to the back of the room, I saw four familiar faces that I recognized from base. A chaplain, two co-workers and my fearless leader traveled the 303 miles to be there for me and my family. I felt overwhelmed with emotion to the point I could barely breathe. It may not be as obvious as time passes, but they are still helping me; whether they know it or not, just by being a friend, mentor and always understanding. I don’t know what would have happened without the resources provided to my family by the Air Force and to my family back at McConnell, but I do know that because they picked me up, I can put my best foot forward.